Not more than 5 minutes. All programmes involving interaction with listeners such as phone-in, music requests, talk show, quiz show, audience participation, advice, user-generated content (UGC), counseling; consideration will also be given to the use of complementary platforms such as websites, mobiles etc. Explanatory note: This category recognises the most creative and innovative program which interacts with listeners, best using the wide range of interactive methods available to the public. Work of a single on-air personality either a single performance or a compilation. This could include RJ, host, presenter, anchor, news reader, traffic reporter, news reporter or correspondent. Explanatory note: This category celebrates the personality of the presenter presented in a thirty minute unedited sequence. The judges are looking for a confident voice, fluency of delivery and ability to engage with listeners through a range of presentation elements such as music presentation and/or interview execution and/or scripted and ad-libbed interaction with listeners. Please select your best 30 minutes, unedited sequence. A single episode drama or one of a series/serials. A single documentary or a feature or one of a series. Any kind of programme that can entertain anyone or that is entertaining to all. Any programmes targeted at viewers under 11 years of age (elementary level). Topical coverage of a single news event. Alternating over three (3) years, themes for Sports category are ‘Sports Documentary’, ‘Live Coverage’ and ‘Programme Opening Title Sequence’. 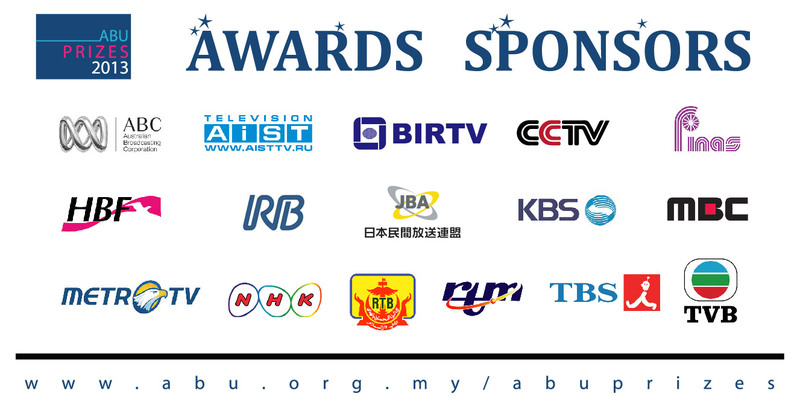 A programme that best delivers the message of ABU’s perspective on the theme of global issue chosen by ABU members and illustrated through their local issue in any form.